A few days ago, i had to take Amma to finish some random errands, bank, pension, etc which was going to eat up the whole day. Since i live in the new part of town, and we had to drive almost 35kms to get all of this done, we also planned to drop in and visit anyone she needed to visit and who is on that route to minimise travelling again. We drove through the older part of Hyderabad, where I grew up and went to school and college, the house I grew up in….congested, crazy and ‘gone to the dogs’ with chaos….. the memories that came flooding back….. i saw my old school….. the place i used to go for tuitions, the market we went to pick up fruit and vegetables…..some of the old houses, still there, jostling for space with the swanky new Barista and Dominos pizza place…. Hitech City, where i live, has its own character…. gargantuan buildings of glass and steel, new buildings choc a block with the old ones which were part of the colonies that used to be considered the outskirts of what was then the city limits…. we have more organised traffic, better laid out colonies and yet, sometimes i feel i don’t live in Hyderabad…. i’ve written about this before too…. As we ticked off one task after another and were driving back home, we passed by this whole street full of fruit….i couldn’t resist stopping to pick some up…. 5 small boxes of strawberries, chickoos, oranges….each one chosen with care. i now don’t haggle with roadside vendors cos i pay much much more in the stores i usually buy from…. 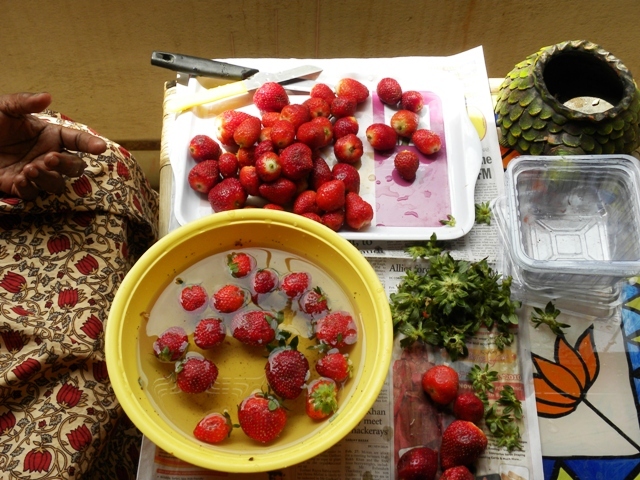 Amma like me, cannot resist vegetable and fruit buying and was happy with the purchases, yet said we’d picked two highly perishables…the strawberries and chickoos…and so the next day, she set up shop to wash, hull and chop the strawberries to be frozen so i could have some breathing space while i decided how i wanted to use them…. The chickoos didn’t last long and were the first to go…. the strawberries, went into one of my favourite Baskin Robbins flavour… strawberry banana icecream which i have made many times before, but its never made it to the blog because it doesn’t last to be photographed……..this too was the last two scoops!! 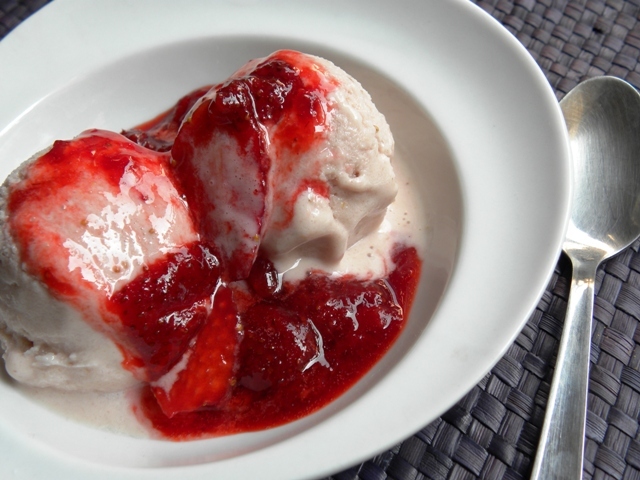 All through the summer, i am planning to crib less about the heat, and make use of all the fruit that surrounds us… melons, mangoes, chickoos and oranges… am going to try my hand at sorbets and icecreams and frozen yogurt….. In a microwave safe bowl, sprinkle 1 teaspoon of sugar over the sliced banana and add the lemon juice and cook on high for 2 mins. Add the strawberries, mix and cook for 1 min. Remove and cool. In the blender jar of a mixie, add all the ingredients including the cooked fruit and whizz for 1 minute or till everything becomes like a really thick milkshake. Pour it in a plastic jar with a wide mouth and tight fitting lid and set in the freezer. Check 4-5 times after every hour and whisk with a fork or an immersion blender to remove icicles. After the last time of whisking, leave to set about 1-2 hrs before serving. Since there are no artificial stabilizers in this ice cream, icicles tend to form if stored for longer periods of time. Mix everything together in a heavy bottom pan, bring to a boil and simmer about 10 minutes till it becomes thick. Cool and serve with icecream. Keeps in the fridge for 3-4 days. great…specially because its eggless 🙂 how long will it last outside the freezer?can i make it an ice cream cake? Loved this idea, I will try this during our upcoming summer. God ! have not seen your posts in a while I wonder what happened to my subscribing to them. 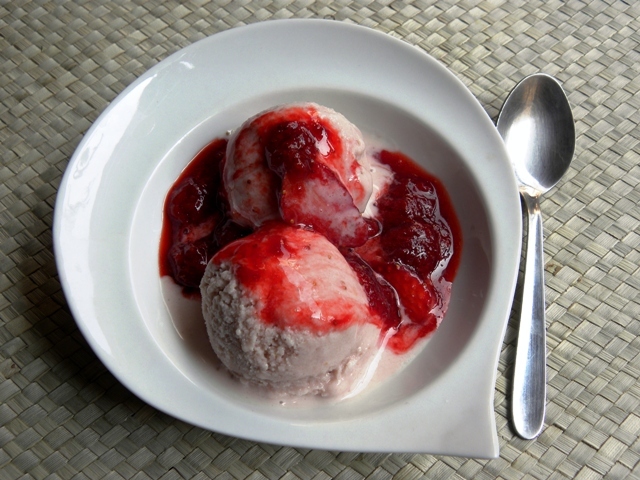 Very nice ice cream without icream maker.Thanks for sharing. The ice-cream looks so good! Anything home-made is always fabulous. I miss Hyderabad a lot. Cant wait to visit it again and check out all the changes in the city my friends talk about. oh yes… the cityscape has changed… but the old hyderabad still retains its charm… i hope you make a visit soon mona… i would love to meet you….have you eaten the pail icecream at famous?? oh!! its to die for!! Looks so perfect. great way to welcome summer! 🙂 more frozen desserts planned for the summer DV!! a perfect treat for a hot afternoon! yes aparna…. it was a wonderful treat!! So simple and so good- thanks for the vodka tip! 🙂 i hope you get to try it out soon nupur! Looks yummy!!! have to try it this weekend. And OMG… S and I have these long discussions about Hyd…and according to him, the Hyd I know and love is not Hyderabad at all… I tell him that to me, it is. Jubilee Hills is as much Hyderabad as is Nallakunta! That sounds so simple! And loved your description of the old and new hyderabad 🙂 Am yet to see the old I guess, one day will do it with you….